The events adopt the color of external events dropped on the calendar and adjust their duration according to a custom “data-*” attribute of the dropped element. If you already bought the book, you will receive the update for free. So, it is always recommended to use the ISO 8601 format in the event objects we feed `fullCalendar`. For dates use “YYYY-MM-DD” and for combined date and time use one of these: “YYYY-MM-DD hh:mm:ss” or “YYYY-MM-DDThh:mm:ss“, where a space or the letter “T” separates the time from the date. The time uses the 24-hour clock format. When the events are generated by a server side application you must take care of correctly formatting the `start` and `end` dates and times. For example, in Python we will always use this formatting strings: “%Y-%m-%d” for dates and “%Y%m-%d %H:%M:%S” for date and time. I should mention that MomentJS is very capable of parsing almost any reasonable date/time string, but I think we should take responsibility for returning what it expects by default. Of course, this will not always be possible, specially if we do not have control of the application generating the events. 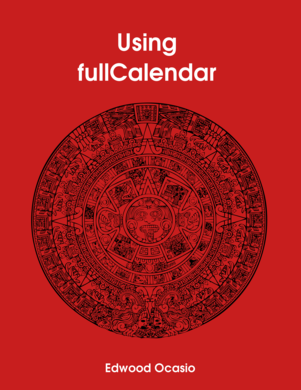 This sample has just enough code to have a working fullCalendar instance.